Danish Artist Transforms a Chambers Street Gallery into a "Camera Obscura"
Troels Steenholdt Heiredal, a Danish architect, was spending a lot of time in his new camera last month, taking pictures of Chambers Street. That’s right. He was in the camera. 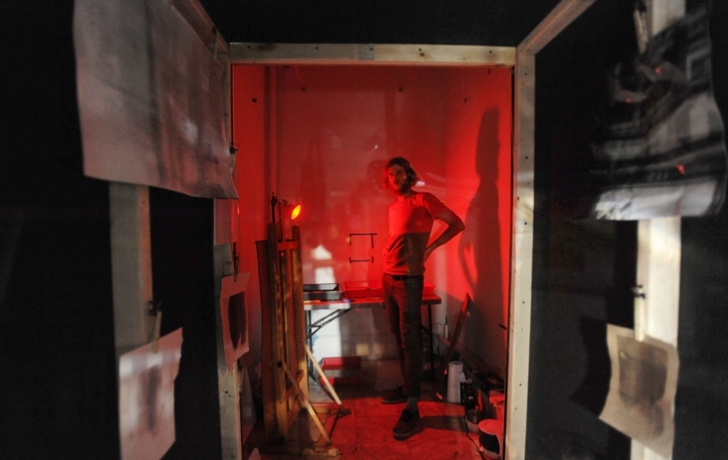 Through an arrangement with Dio­nisio Cortes and Leticia Ortega, who run Front Art Space, the 48-square-foot gallery at 118 Chambers St., Heiredal turned the tiny storefront space into a camera obscura, an image-capturing device so technologically retro that its origins predate photography. The three week project ended last month. “Camera obscura” is Latin for “dark chamber” and long before photography’s invention, artists created dark rooms and boxes with tiny holes for lenses that projected images that they could trace. The first photographic cameras were camera obscura boxes, with light-sensitive materials added. “I cheated,” said Heiredal, 30, noting that rather than a pinhole, his camera obscura used lenses made for glasses. There were three of them, mounted on the front, side and top of a wooden extention he built onto the front of the gallery, which he could roll out a few feet onto the sidewalk. The protruding structure allowed Heiredal, with the use of mirrors, to record and combine pictures looking west along Chambers Street and at the building’s facade above him as well as across the street. It also served as an entrance for passersby who would step gingerly into the dark, airless space, where Heiredal was often on hand to explain his project and show his experimental images. Standing behind a rolled-down sheet of tracing paper, visitors could see the projection of street life from the three lenses, “multi-exposure in real time,” Heiredal called it. To take pictures, he taped light-sensitive photo print paper to the wall or an easel or held it in his hand. The process allowed Heiredal to be an explorer of light and imagery, to bend, twist, crumple or cut the paper, then expose it (anywhere from one second to hours) and see the results. Heiredal had long experimented with multiple exposures using film cameras but wanted to be “in there,” he said. Heiredal said he never knows quite what to expect. But with trays of chemicals at his side, he soon saw the results. A bit like a human Polaroid, he developed the pictures there inside the camera. Though he could have made positive prints from the images, Heiredal chose to keep them as negatives, excited to see what happened to the lines of the building across the street when he twisted the paper, or a car drove by or someone stood on the sidewalk long enough to be captured. The possibilities were endless.